I was going to call this, “Curly ‘Fro: Take Two” (see “take one” here). However, this time it reeeeeally looked nothing like a ‘fro and turned out very similar to my old Twist n’ Curl (TnC) … so, yeah. 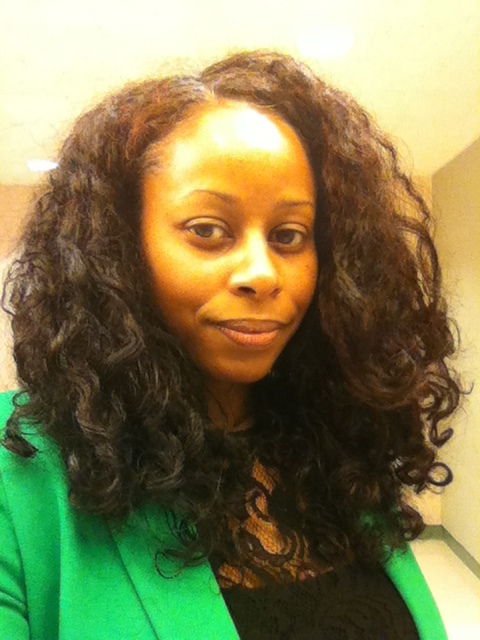 Anywho, as you know, last week I attended the CurlyNikki Curl Power Event. I decided that I wanted to try a hybrid of the MahoganyCurls and PGneiicey methods of creating a curly ‘fro. 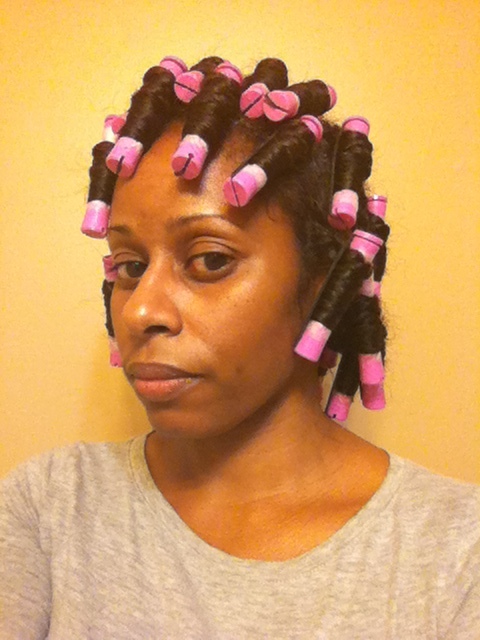 I hit Sally’s on Tuesday night for more perm rods. My intent originally was to get more grey rods as I thought that I might not have enough. Instead, when I got to Sally’s, I saw the slightly larger pink ones and decided to get those as I wanted bigger hair than I achieved the last time. 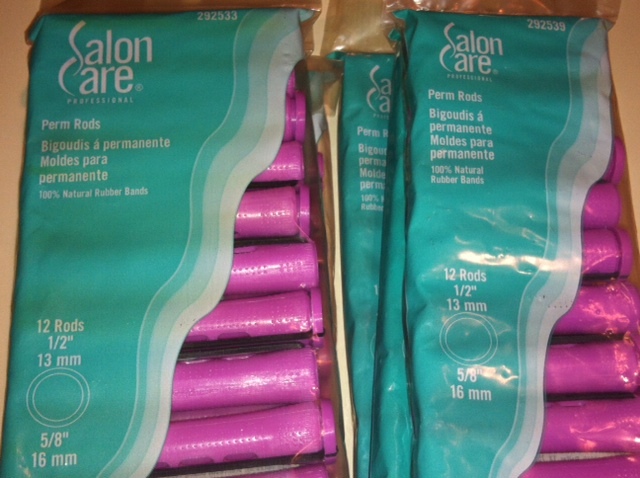 And, get this, the perm rods were on sale 2 for $3!!!! The rods on the right are shorter, although the labeling is no different. I got the shorter ones for my front as they only had 3 bags of the longer rods. Started with dry hair that had been in twists for a day and a twist-out for a day. Finger detangled dry hair in about 10 sections with my coconut oil whip. Y’all … this part took FOREVER, mostly because of my nape area which has been knotting and tangling badly :(. Once I detangled each section, I twisted it. Starting from the back and moving forward, I applied a dab of Shea Moisture Raw Shea Restorative Conditioner and a dab of Eco Styler Olive Oil Gel to a small sections. Then, I twisted to about halfway down the length of my hair and set the whole length on a perm rod wrapped in end paper (the end paper prevents my hair from snagging and tearing out when the rods are removed). I used a total of 28 rods, so only 2 1/3 bags of rods, to set my hair and it took THREE HOURS!! Ughhhh!! As y’all know, as I was applying the product, my hair was looking soooo stringy. I had a flashback on CurlyNikki’s WnG experience with it. Remember that? If not, see here. F’reals … I was definitely afraid that I would end up looking like Randy Watson!! 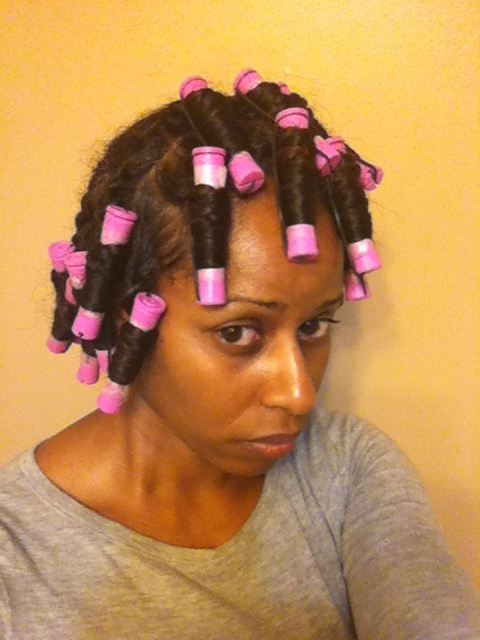 Fortunately, all was right with the world when I removed the rollers and released the twists the next day :). So, here is the tale in pics and the final results. Dry hair prior to detangling. You can see the texture difference in this shot. Encountered several of these horrid tangles and knots. After I finished dry detangling with my coconut oil whip. Released from rods, but still twisted. That face is one of RELIEF!! Untwisted but not separated further. So, I was very pleased, even though my hair didn’t end up being as big as I would have liked. I was really surprised at how soft of a set the Eco Styler Olive Oil gel provided!! I’ll be trying this again, but on damp hair with the smaller grey rods. But I won’t be doing that for a minute as my hair really needs a break from being worn down. The cold winter and all this friction from rubbing against my coat and clothes has been doing a number on my nape and I ain’t got time for all of that. Oh, and as to day 2 hair? Well, I twisted it into four big twists on Wednesday night, so those Shirley Temple like curls didn’t last long. 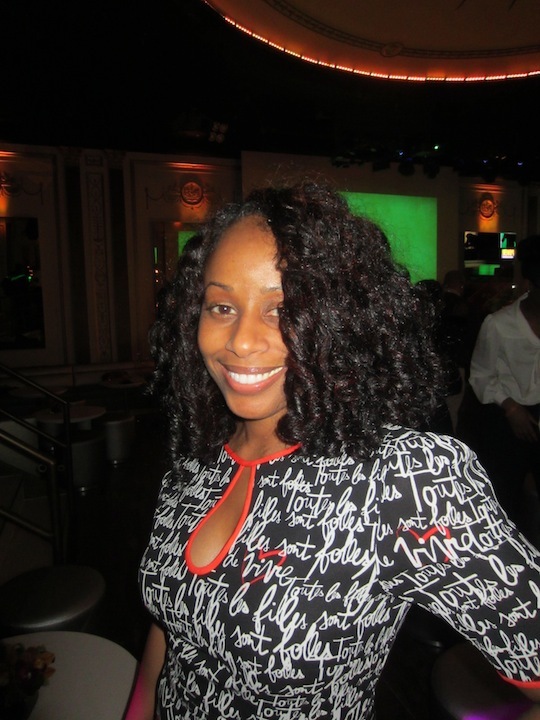 I had bigger waves … but, you know, I was feeling it!! Do you use Eco Styler Gel for styling? Which one is your favorite? How do you use them? 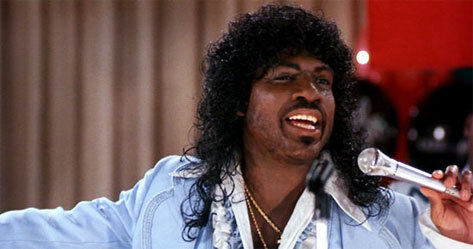 Girl, you ended up looking FAB…just like sexual chocolate!!! 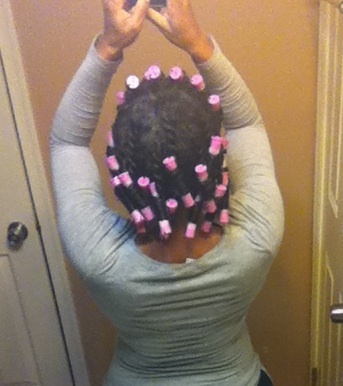 LOL The 2nd day hair is luscious…. 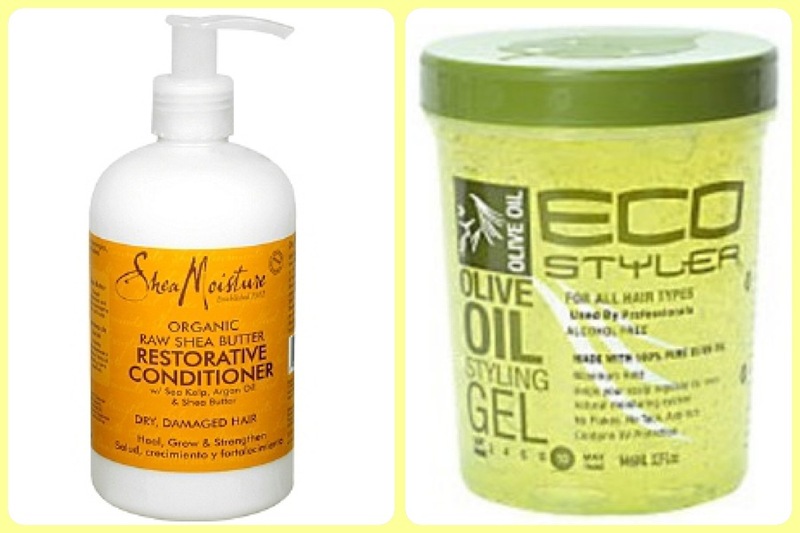 I actually use Eco styler gel olive oil and the argan oil for any flexi rod or rod set on my transitioning hair!! Your hair looks gorgeous on both first and second day! I love Ecostyler Clear and Ecostyler Argan oil. These seem to be the only gels which work for me. They do not dry my hair out and give it sheen and hold without crunch. I always put a light leave in on damp hair and light oil on the ends before applying the gel. Shelli – it came out great! 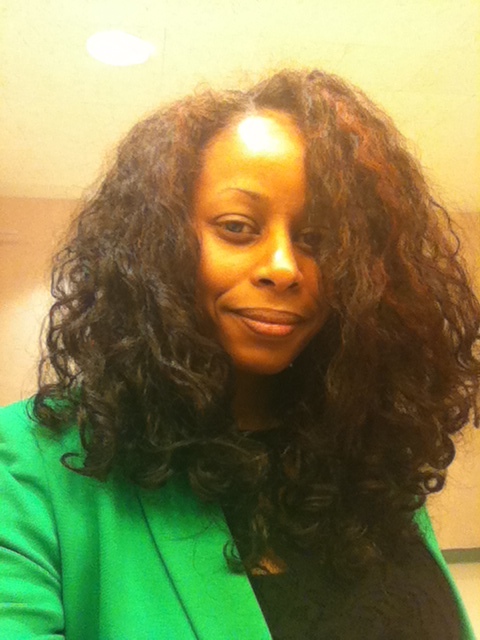 My sister has 4a curls and lives by the Argan EcoStyler. Yes, she has helmet hair and flattened ‘fro when whe wakes up in the morning. 4a girls like my sis let the shower sprinkle it, give it a shake and fluff it back into shape when out of the shower. She lets it dry on the commute to work, blasting the AC in summer, heater in winter. As for me, I can’t stand hard hair and I have 4 colors of Eco (crystal, pink, argan, olive oil) gathering dust in my “rejects bin”. I don’t think my sis does a layering ‘cocktail’ or ‘LOC method’ either. Sheesh! I just watched a video by Jenelle of KinkyCurlyCoilyMe! where she said she had HG stylers for different seasons for her braid outs. In summer she preferred Miss Jesse’s Curly Buttercreme because it stands up to humidity without too much crispiness, and in winter she LOCs with Shea Moisture CES because her hair craves moisture. She said it makes a difference in how long her style lasts. I’m going to look into that because I have both products (in my rejects bin).